The routine therapeutic use of antibiotics has caused resistance genes to be disseminated across microbial populations. In particular, bacterial strains having antibiotic resistance genes are frequently observed in the human microbiome. Moreover, multidrug-resistant pathogens are now widely spread, threatening public health. Such genes are transferred and spread among bacteria even in different environments. Advances in high throughput sequencing technology and computational algorithms have accelerated investigation into antibiotic resistance genes of bacteria. Such studies have revealed that the antibiotic resistance genes are located close to the mobility-associated genes, which promotes their dissemination. An increasing level of information on genomic sequences of resistome should expedite research on drug-resistance in our body and environment, thereby contributing to the development of public health policy. In this review, the high prevalence of antibiotic resistance genes and their exchange in the human and environmental microbiome is discussed with respect to the genomic contents. The relationships among diverse resistomes, related bacterial species, and the antibiotics are reviewed. In addition, recent advances in bioinformatics approaches to investigate such relationships are discussed. 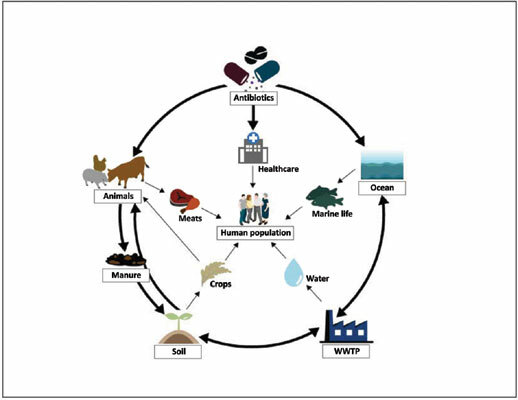 Resistome, Microbiome, Antibiotic resistance genes, Metagenomics, Environmental microbiomes, Human microbiome.